This dress, hat and booties were all done in sock yarn (Cascades 220) was designed for my great niece Ava. I used unusual color combinations but they worked for a more modern look. Handspun to lightweight novelty yarn. Sweater Coat titled "SOAR Fall Leaves". Machine knit with crocheted rib. Polworth four-ply with handspun angora, yak down, silk and wool highlights. The yarn is a single spun from Louet wool top, spun by Cathy Paulson's Los Angles Unified's 4th grade class of students, designed and knitted by Gwen Powell. I give a one hour enrichment program for elementary school students. 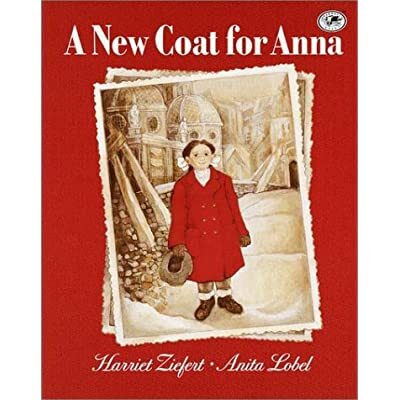 I follow the story "A New Coat for Anna"
In 2011 the class spun enough of the same wool for a hat for Mrs. Paulson. Next year we might do mittens! This pug was crocheted from a pattern that my hairdresser purchased. She did not know how to crochet so I made it for her. I also than adapted the pattern to make a French Bull Dog.